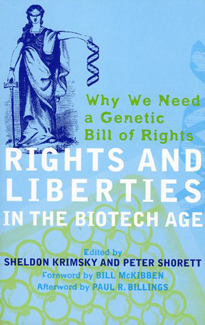 Peter Shorett is the co-editor of Rights and Liberties in the Biotech Age: Why We Need a Genetic Bill of Rights (2005). The book is a collection of essays written by prominent university scientists, civil rights lawyers, and public interest activists who bring their perspectives to issues where science and civil liberties meet head on. Instead of human rights adapting to technological change, the authors believe that such rights need to be at the forefront of any discussion about biomedical and bio-agricultural advances.